Cupcakes are one of my favorite treats to make for any special occasion. Mostly because they do more then just give your guests something tasty to eat...they can add to the decor as well! 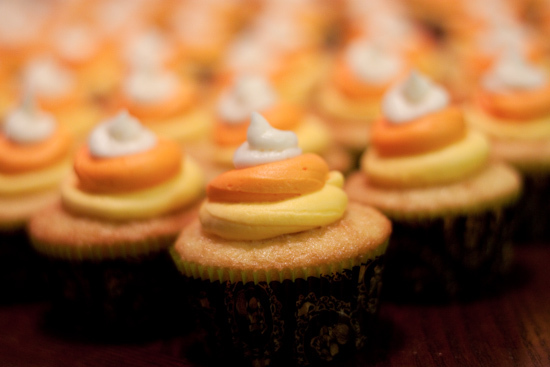 I made these "Candy Corn" cupcakes last year for both a family Halloween party and my husbands work Halloween party. They were a hit and were so simple to decorate! Halloween is still about 6 weeks away, but It's one of my favorite holidays and I am getting excited to try some new festive treats to celebrate! Do you have a favorite treat you like to make for Halloween? I love me some candy corn! This is too cute for words! I have to make a bunch of cupcakes for this weekend and now I know what I'm doing!! These are adorable! 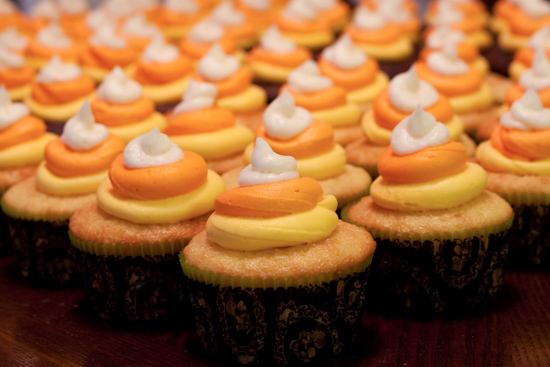 Candy corns are my favorite halloween candy so I want to try this cupcake idea! They're beautiful! I love fall and Halloween! Halloween is coming up so soon! Cute cupcakes! Adorable cupcakes! Are they just vanilla? They seem to have an orange tint to them?